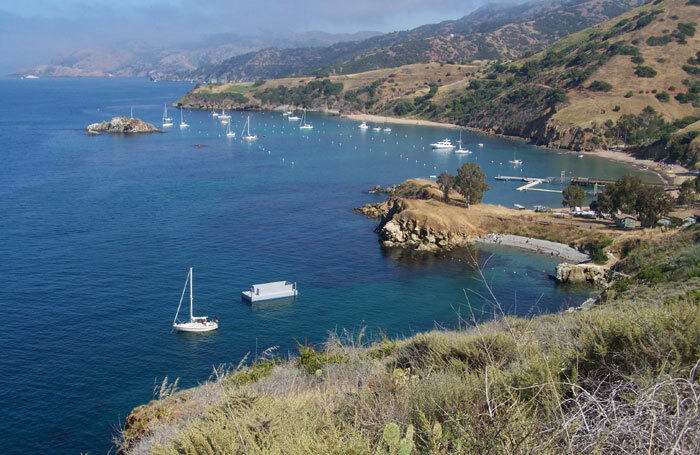 NEWPORT BEACH — Boaters planning to cruise to Catalina Island no longer need to worry about being sent back to the mainland if the mooring fields are at capacity, after they take a hands-on class focused on teaching all the skills needed to anchor in coves around the island. The class “Anchoring at Catalina: No Moorings? No Problem!” is offered by Orange Coast College’s School of Sailing and Seamanship and was designed to teach boat owners how to confidently anchor in waters around the island. The next session is set for Aug. 9-11. Each year, Hughston teaches three sessions through the school, where he welcomes six students aboard an on-water classroom: the 42-foot auxiliary sloop, Betty. Once aboard Betty, students spend the first of the three-day trip getting to know each other and following Hughston’s instructions on navigating the passage. Each person rotates duties, checking gauges, logging entries, checking engine conditions and navigating to Emerald Bay. They begin anchoring on the second day of the trip — where they learn that, with more than 21 spots to anchor along the island, time can be better spent exploring the island instead of waiting for a mooring. Students spend the day setting bow and stern anchors at Little Fisherman and work their way east. Jeff Mongelli, who typically leaves on a Thursday for a weekend trip to Catalina four to five times a year, said he was motivated to take the course so he no longer would need to rely on an opening mooring. For Marco Montes, the class experience increased his confidence in heading to island. “I have no worry that if I don’t get a mooring, I won’t be able to anchor,” he said. It also opened his eyes to other spots to visit around the island. The crew learns how to measure out appropriate anchor rode for the scope and set the anchor. By the end of the day, Hughston, a Coast Guard-licensed master (100 tons) and a US Sailing-certified instructor, gives students lessons to practice. On the last day of the class, Sunday, they sail Betty back to Newport Beach — on their own. For the upcoming course schedule, visit occsailing.com.